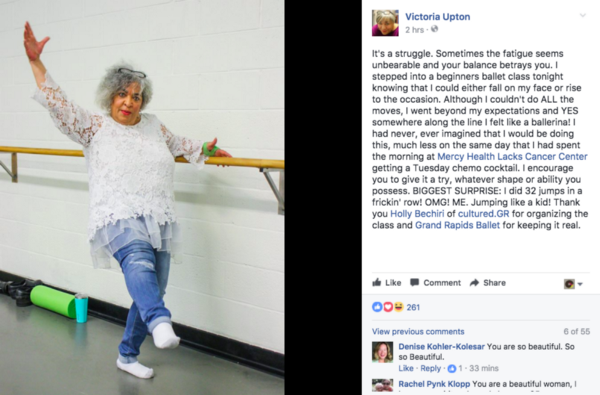 Dawnell Dryja—long-time company member and audience favorite—announced her retirement from the stage will occur during the Grand Rapids Ballet’s 16th season. She will dance in the first show of the 2017-18 season only (From Russia with Love) and continue to be involved at GRB in her new role as artistic coordinator. “Dawnell will be missed from our stage, but not from our hearts or the joyful memories we have of her wonderful performances,” said GRB Artistic Director Patricia Barker. 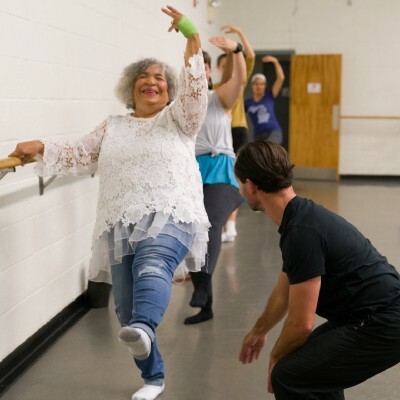 Ms. Dryja was born and raised in Canton, Michigan and formally trained under her mother, Dawn Greene, the owner and artistic director of Grosse Ile Academy of Dance. She also studied at the School of Ballet Chicago, Cleveland Ballet School, and Milwaukee Ballet School—all on scholarship. Prior to joining GRB, she danced with Tulsa Ballet, Cincinnati Ballet, Dayton Ballet, and Metropolitan Ballet Theatre of Detroit. She is proficient in ballet, tap, jazz, contemporary, and modern dance. Her repertoire includes many leading roles from the classics to contemporary masterpieces, including Swan Lake, Giselle, Coppelia, Don Quixote, Sleeping Beauty, A Midsummer Night’s Dream, Where The Wild Things Are, Dracula, Red Angels, Rapture, Celts, Fingerprints, Jewels, Serenade, Who Cares?, Allegro Brilliante, Concerto Barocco, Slaughter On Tenth Avenue, Con Amore, and Il Distratto. She has worked with esteemed choreographers such as Nils Christe, Frederick Franklin, Kirk Peterson, Val Caniparoli, Suzanne Ferrell, Mario Radacovsky, Gordon Peirce Schmidt, Bruce Wells, Stanton Welch and Raymond Lukens. performance are not available to the general public. She is also the owner and artistic director of Academy of Dance Arts. She is married to Bryce Black and the couple have one daughter, Tevyn, who has inherited her mother’s love of dance and performing. You can also read a lovely interview with Dawnell in the September issue of Women’s Lifestyle Magazine. Don’t miss her final performances! Get your tickets to From Russia with Love here today . HOLLAND, MI (WHTC-AM/FM) – Grand Rapids Ballet School will be holding classes at the Holland Area Arts Council starting in September. A partnership with the Arts Council through the years with the the school’s performance of the Nutcracker Ballet and the “tea party with Clara” event every December prompted the expansion. Their was just a great interest in the December event that the school decided to bring their faculty to Holland. The classes will give kids ages 3-9 years old a chance to learn ballet. The school will also hold classes for those with Down Syndrome and Parkinson’s disease as well. 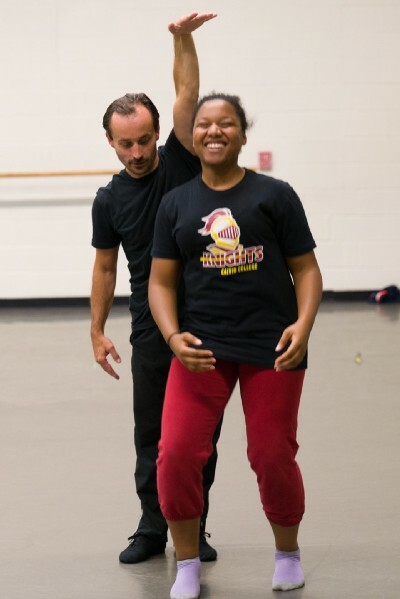 Attila Mosolygo is the Director and Principal of Grand Rapids School of Ballet (GRBS) and says he believes strongly that dance plays an important role in the healthy development of your child’s focus, coordination, discipline, and etiquette. Mosolygo starting training in Hungary and by the time he was 12-year-old knew he would be dancing. After moving to America he studied at the Joffrey Ballet and an audition with the Grand Rapids Ballet led him to Michigan. Mosolygo says the classes for Down Syndrome students first started in Grand Rapids and the results were fantastic. In an effort to make sure they can fill the classes, you are asked to register as soon as possible so that the school has an idea of how nany students they will be training. Classes start on Monday September 11 and will run until Monday, May 7, 2018. Ballet classes are available for children 3-4 and 7-9 and children with Down syndrome age 5 and up, and do not require prior dance or ballet experience. Dress code Girls: soft pink leotard, soft pink tights, and pink ballet shoes. Boys: black ballet tights or black leggings, black ballet shoes, plain white fitted t-shirt. Dress code: Girls: lavender leotard, soft pink tights, and pink ballet shoes. Boys: black ballet tights or black leggings, black ballet shoes, plain white fitted t-shirt. Cost: $3 for Evergreen Commons members / $5 for non-members. Holland Area Arts Council is located at in downtown at 150 East 8th Street, Holland, Michigan 49423. Evergreen Commons is located at 480 State Street, Holland, Michigan 49423. For more information on all the GRBS classes offered in Holland, including schedules, costs, directions, enrollment, and financial aid, please visit grballet.com/holland, email school@grballet.com, or call 616.454.4771 x17. Celebrating its 47th anniversary, Grand Rapids Ballet will kick off the 2017-2018 seasons with From Russia with Love. Performances are October 6-8 & 13, 2017 at the Peter Martin Wege Theatre. Grand Rapids Ballet School provides over 200 students with the highest quality dance instruction in a nurturing and encouraging environment and the opportunity to perform in productions by Grand Rapids Junior Company. Keep up with the ballet on Twitter, Facebook, Instagram, and YouTube. Adult Ballet Classes: The Grand Rapids Ballet offers ballet classes for those with or without experience. Our members got an introduction to those classes Tuesday night—and left inspired, exhilarated, and well… wobbly. 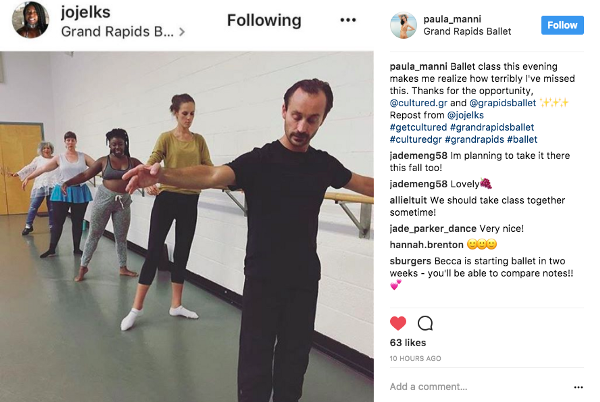 cultured.GR members had an introductory ballet class with the Grand Rapids Ballet School Director & Junior Company Artistic Director, Attila Mosolygo. Image credit Eric Bouwens. Along with classes for adorable little kids at the Grand Rapids Ballet (GRB), there are also adult ballet classes on offer, whether you have any experience in ballet or not. Classes are held on a weekly basis, and the first class is free for those interested in trying it out. At just $15 per class and even less when purchasing a 10-class punch card, the price is comparable to other exercise classes like yoga or aerobics, and doesn’t require special equipment to participate. All that’s needed are comfortable clothes to move in and a pair of socks. All images credit Eric Bouwens. Our cultured.GR members were invited to a special introductory ballet class just for us, with the school director Attila Mosolygo guiding us through what we would experience in a regular class, from bar exercises to jumps to stretches. Mosolygo, who has been with GRB for 25 years, doesn’t normally teach these classes, so it was a very special introduction. “When I started with the Grand Rapids Ballet, we had six dancers in the company,” Mosolygo revealed, showing just how much the organization has grown over the years. The company now includes over 30 dancers, apprentices, and trainees. We found out after the class that cultured.GR member Victoria Upton had spent her morning receiving chemo. Image credit Eric Bouwens. Paula Manni (directly behind Attila Mosolygo) was one member who had taken ballet as a child and is now inspired to get back into it. Image courtesy Johannah Jelks. Some of our members had grown up doing ballet, and others had not taken a single dance class in their lives. Whatever the experience level, the ballet class proved to be an incredibly strenuous—and incredibly peaceful and inspiring—experience. This is no easy sport. This is perhaps the most serious workout that many of us had ever experienced. Mosolygo explained to our group that both boxers and football players are known for taking ballet for the benefits it brings to them for both protecting against injury and improving their abilities in their primary sport. We don’t think anyone in our group sustained any injuries either (we’ll let you know in the morning), though jokes were made about the difficulty in walking at a fast pace, navigating steps, and just plain standing up without buckling. 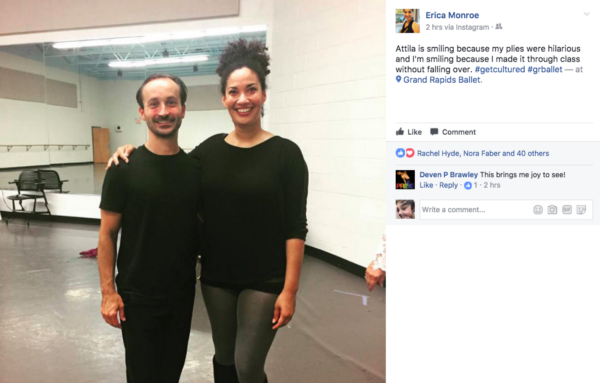 All the same, many of us are excited to come back for more now that we’ve had a taste of what’s available for adults at Grand Rapids Ballet. • Discounted prices for students, seniors, and season ticket holders. Information about classes available online. 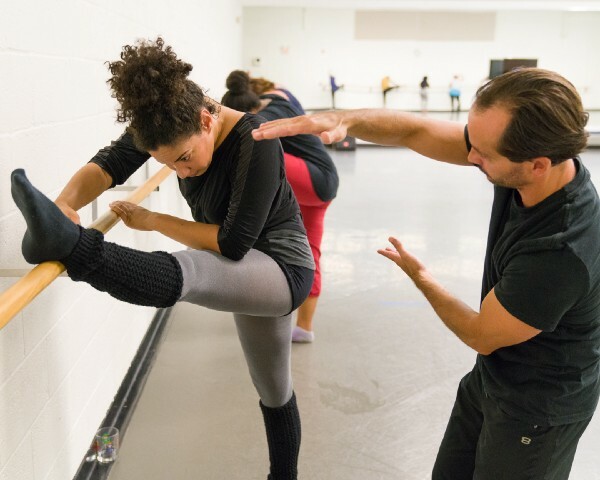 Grand Rapids Ballet (GRB) announced today that they are formally beginning a search for a new artistic director for Michigan’s only professional ballet company. Current artistic director, Patricia Barker, announced in June that she accepted the artistic director appointment at Royal New Zealand Ballet (RNZB). Barker has been in this position with GRB since 2010, and will split her time between GRB and RNZB until the end of the 2017-18 season. A search committee has been formed within GRB that includes current board members, company dancers, and community leaders. Applications will be accepted August 15 through September 15, 2017. Interviews will begin in early October with a final decision being made by early December 2017. A complete job description and details on how to apply can be found at grballet.com/ADsearch. No phone calls, please.